Did some repairs to the water lines. I chose not to go back to the drip lines for now as they’re a pain to put in. I may return to them next year as they’re way more efficient, but time being of the essence since I’m behind in getting the garden going this year, I chose quick and dirty. 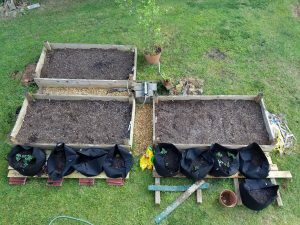 You can see from last week to this week, the potatoes I put in the first bags have already made noticeable progress. So, 2017 was a bust. 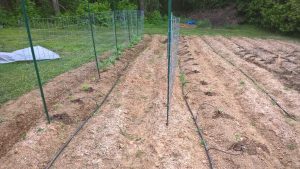 Changing jobs (not by choice), family health issues, and assorted other problems proved to be too much of a distraction to actually have a successful garden (or post anything on my site for that matter). 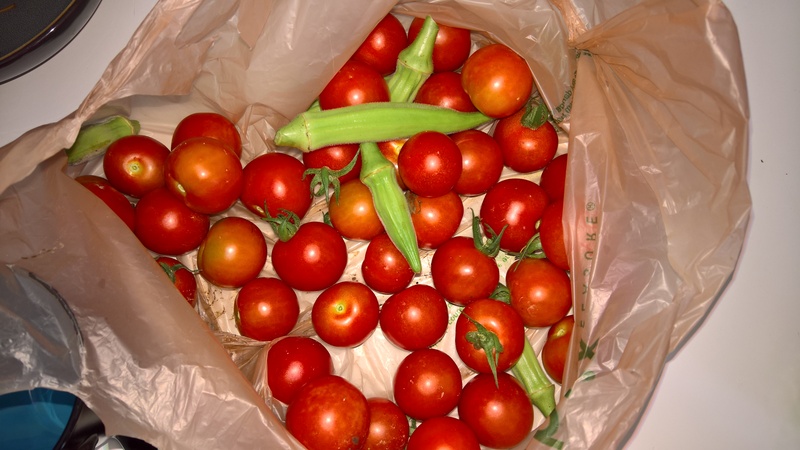 We got a small collection of tomatoes, a few other odds and ends, but the majority either didn’t produce or got eaten. The only bits that were somewhat successful were the eggplant and the dill weed. All in all, a disappointing year. 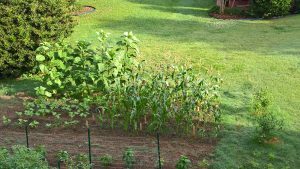 We still have quite a few family health and other issues going, but I have a steady job, and I missed having a garden to work in. I’m going to put in the effort this year to try for a better outcome. I’m getting a late start for the aforementioned reasons plus the weather here in GA has been fickle. So to celebrate my birthday I rented a rear-tine tiller and cleared the ground again. It was overgrown with grass/weed/detritus and the little electric I have wouldn’t hack it. I’ve forgotten how much work those monsters are to run. I had to lean back and keep it from jumping forwarded every time it hit a bit of tough clay, almost felt like I was water skiing behind the tiller most of the afternoon. 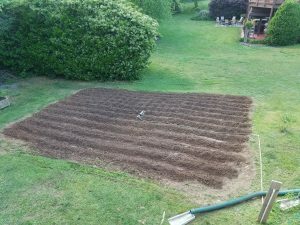 Today I got the peat moss, and other dirt condiments spread out on the ground and tilled it in with my electric. 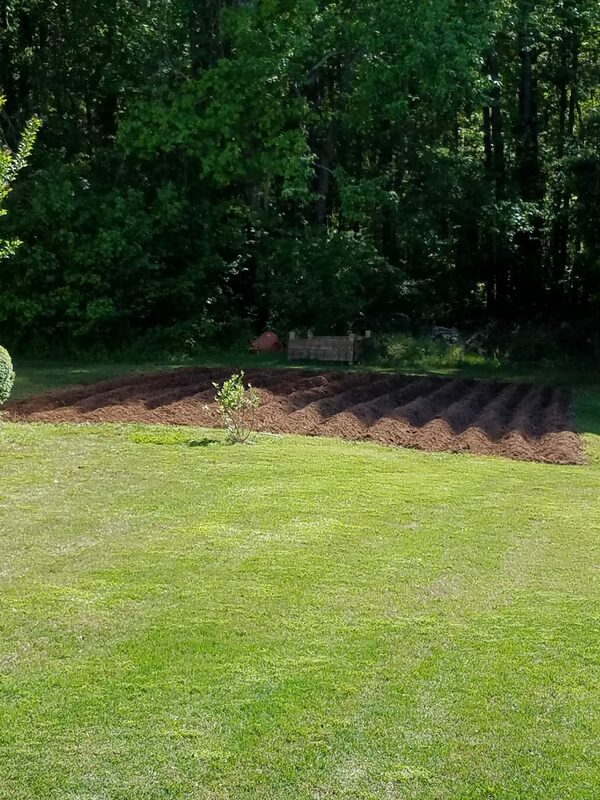 It does a fine job if the ground is already broken up, just can’t do much with hard clay and/or heavy weeds. Then the hard work with the hoe to make the rows. 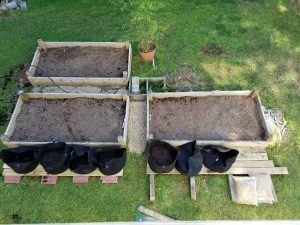 The three raised beds were a mess as well, so cleared those out and added peat moss and perlite. 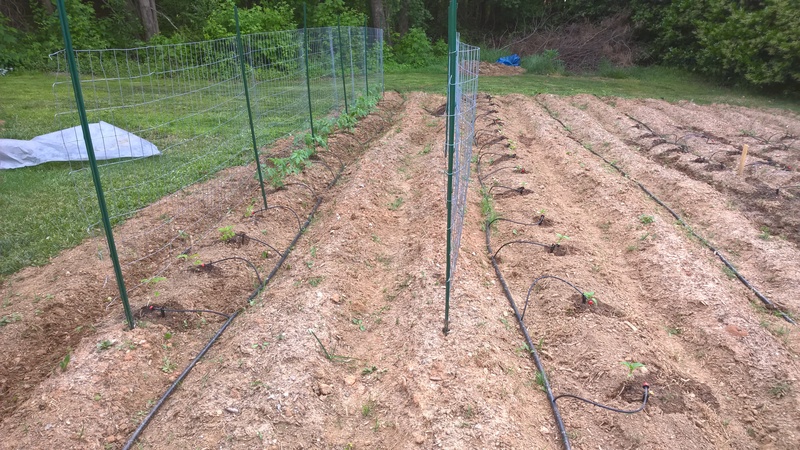 Finally got the potatoes put out too. Growing those in felt bags this year. 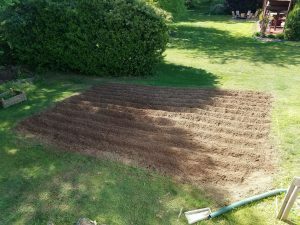 I feel like I’ve been beaten with a dirty stick, but I got the ground ready. Just have to plant the seeds. 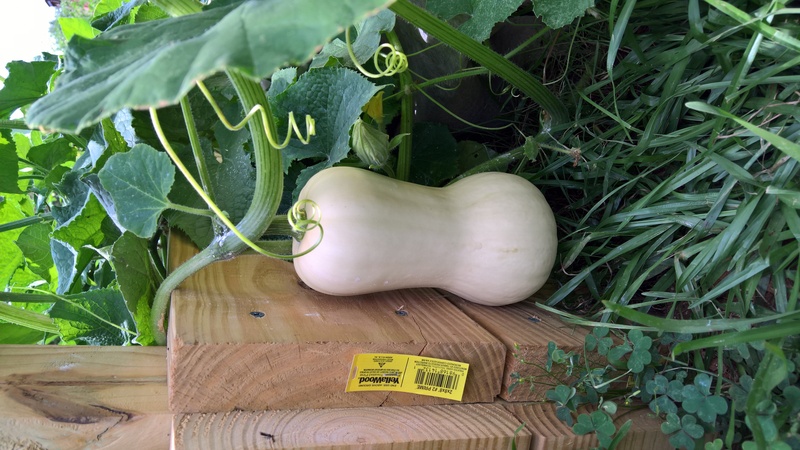 The first big round of butternut squash came in yesterday. Also was able to get a second cantaloupe. The first one was very sweet and juicy. A bunch of the bell peppers were ready to pick too. 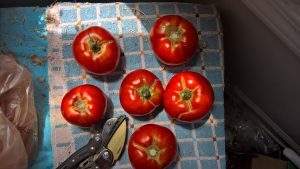 The tomatoes are starting to slow down a bit, I only brought in 15-20 yesterday rather than closer to thirty of the cherry tomatoes. 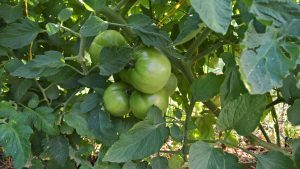 The cherry tomatoes are in mass production. I’m bringing in at least 20 a day currently. The better boy tomatoes are ripening too. I’ve pulled around 13 of those. The bugs and the birds like them too, so I’ve had to pitch a number of them, but I’m still getting new ones. Cucumbers are also doing well, pulled four more of those in the last several days. Okra is hit or miss. Some days a lot, some not so much. 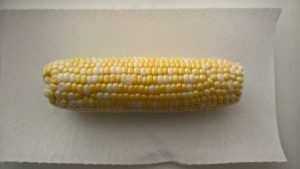 Brought in the remainder of the first round of corn I planted. 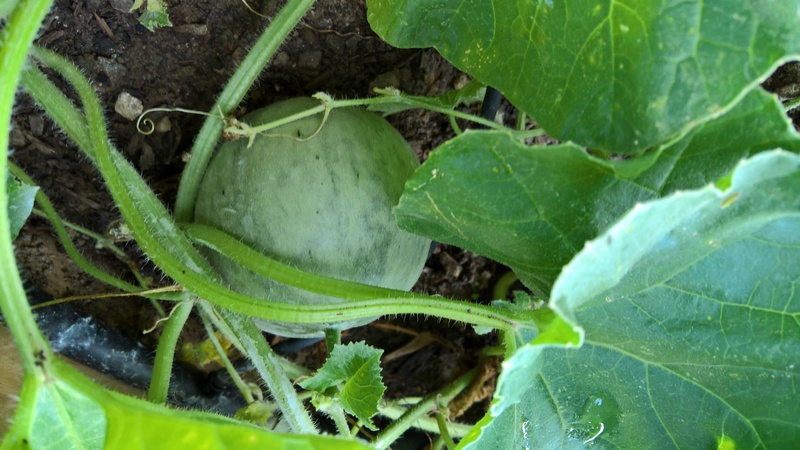 Second round has tasseled and has ears just sprouting silk, so probably a few more weeks for those. 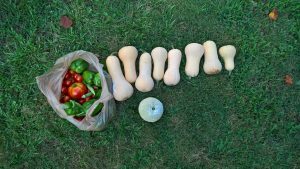 The parents came over and picked up several ears of corn, a butternut squash that wasn’t quite ripe, some cherry tomatoes and bell pepper. The butternut squash got pulled by accident when I (got spooked) found what appears to be a northern brown snake hiding in the cucurbits bed (I thought it was a copperhead at first). 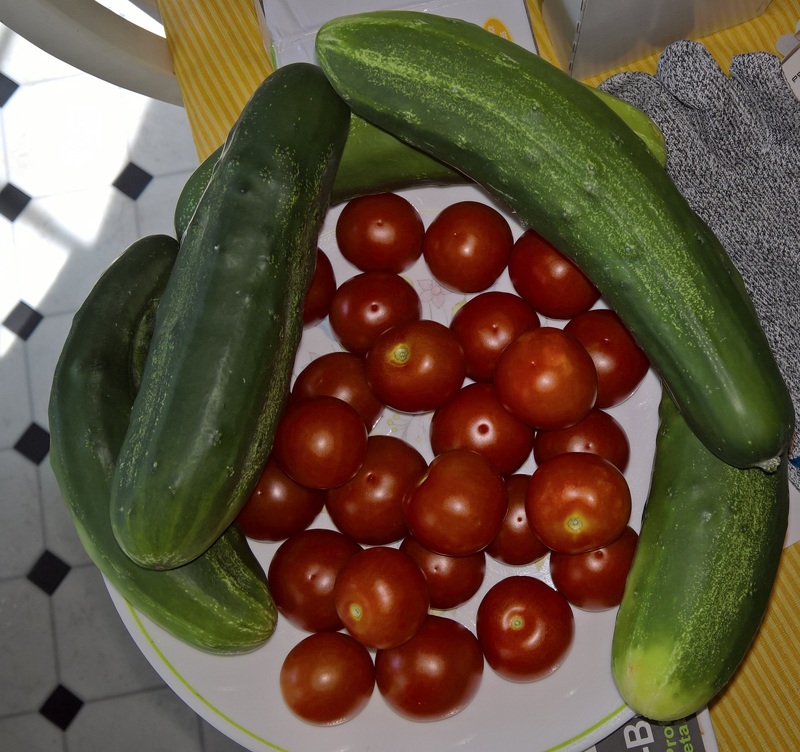 Only had about 5 or so cherry tomatoes that had turned, the rest should probably happen soon. None of the better-boy ones have started yet, but as I mentioned in the earlier post, figuring on early July for those. 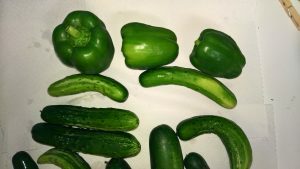 Here’s a shot of some of the bell peppers and cucumbers that got picked recently. The first ear of corn was plucked today! 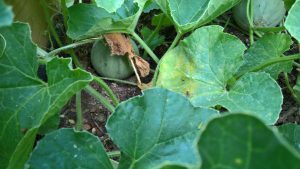 Patience is never any fun when waiting for the fruit of your garden. 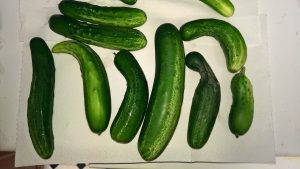 The cucumbers have done pretty well, we’ve pulled at least a dozen or so of them out. Some of them look a little screwy as they were in the corner of the raised bed, so they’re a little bent. They do taste good though. 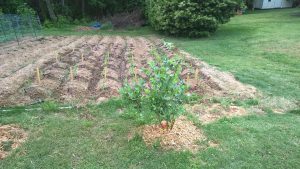 The blueberry bush is done, we got about 8-10 berries, all the rest went (quite literally) to the birds. 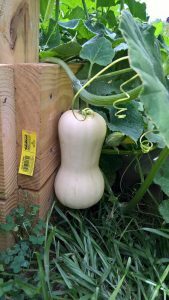 The butternut squash is getting there, not quite ripe, I have a friend of my mother’s giving me some advice there. The tomato vines have significantly slowed down their growth and are fattening up the fruit. 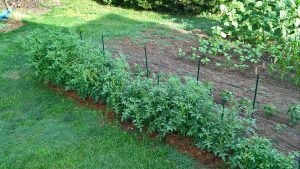 A few of the cherry tomatoes are just starting to turn, so not much longer for those. The others are still waiting, and one of the guys at work said, probably around early July for those. 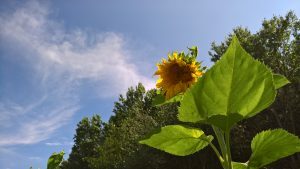 Some of the sunflowers have a good head on them, the rest aren’t quite there. Seeing some progress on the cantaloupes, one’s starting to show the cracked surface. 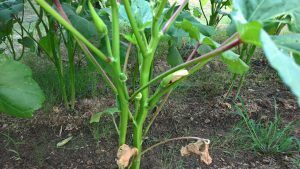 Starting to get growth on the pepper plants. 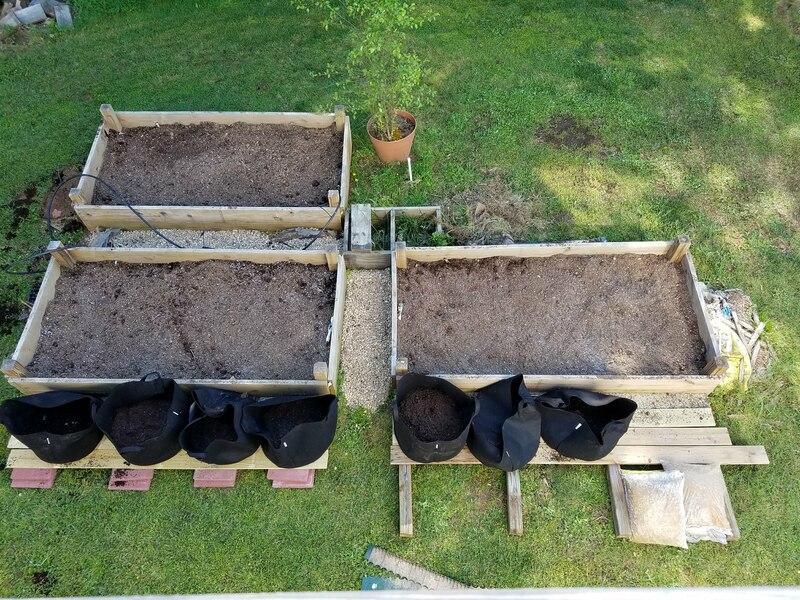 A few jalapenos and bell peppers are growing. 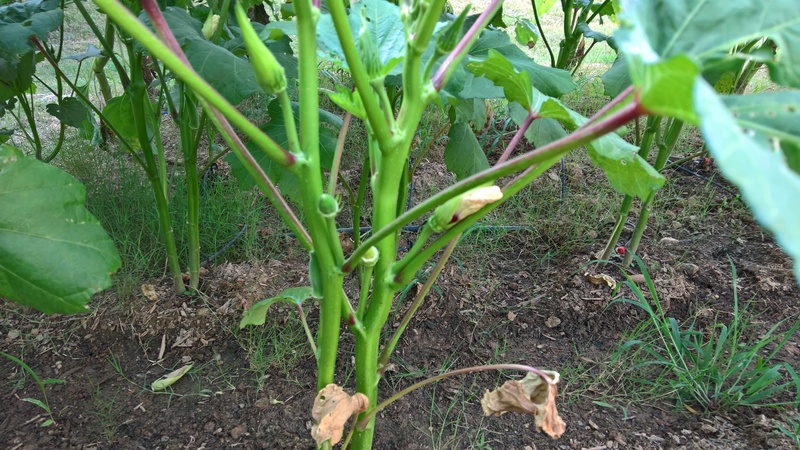 The okra is also starting to show some fruit. 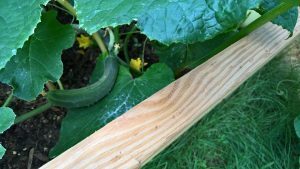 Finally the summer squash plant was destroyed by bugs. Beatles appear to have eaten the center out of the main trunk. 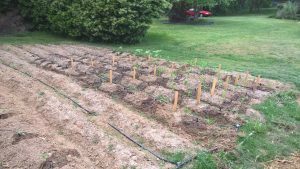 Still trying to deal with the Japanese beetles, they’re quite pain and rapidly trying to eat through the okra and basil. I have a sudsy jar sitting out there to drown them in, but it’s all by hand. 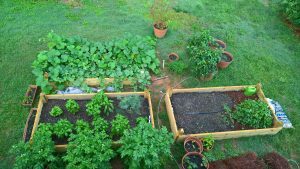 I’ve dabbled with planting vegetables over several years, but always in pots on the back porch. 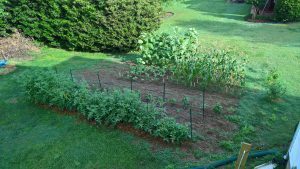 Late summer last year, I decided to give in-ground and raised beds a try. 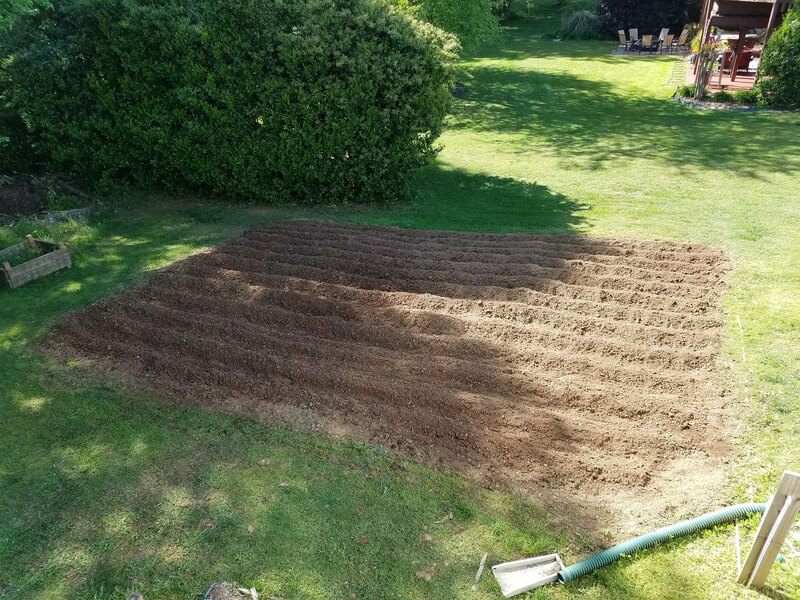 I rented a big rear tine tiller to break up a 25’x30′ patch in my back yard. 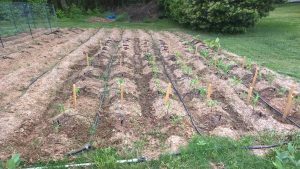 As the ground is over the septic field, I’m using that patch for stuff that grows edible bits above ground like corn, peppers, tomatoes and the like. 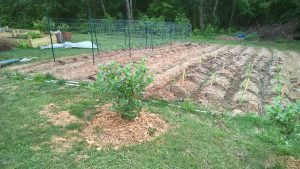 For the stuff that grows in or on the ground I built three raised beds. 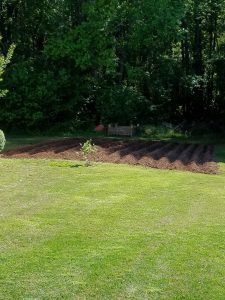 I had 10 cubic yards of landscape mix soil delivered (@1,800 lbs per cubic yard, so 9 US tons). My father and I, using shovels and wheel barrows, moved all of that from the driveway to the backyard. Needless to say that we were quite sore after that. I’ll post some pictures of how it gets along, but so far it’s making what appears to me to be good progress. Here’s a little over a month later. 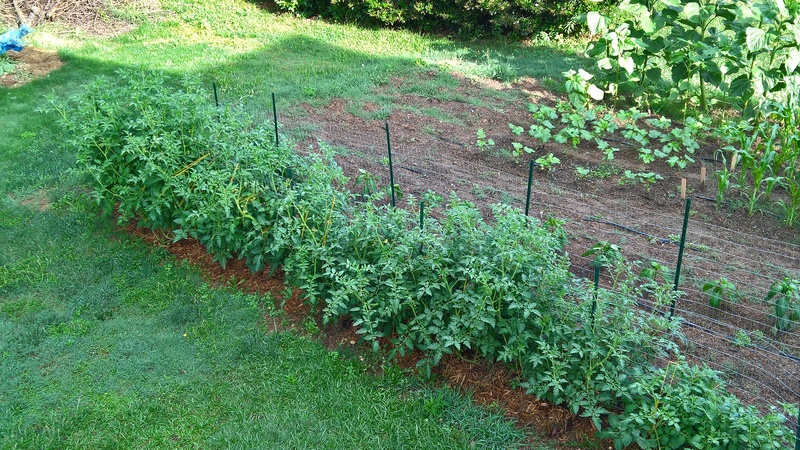 The tomatoes in the back are over 4 feet tall and have lots of fruit, none ripe yet though. 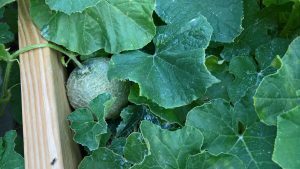 There are several different varieties that got all munged together due to me dropping the container with all the seedlings in it. So much for trying to have it all nice and organized. 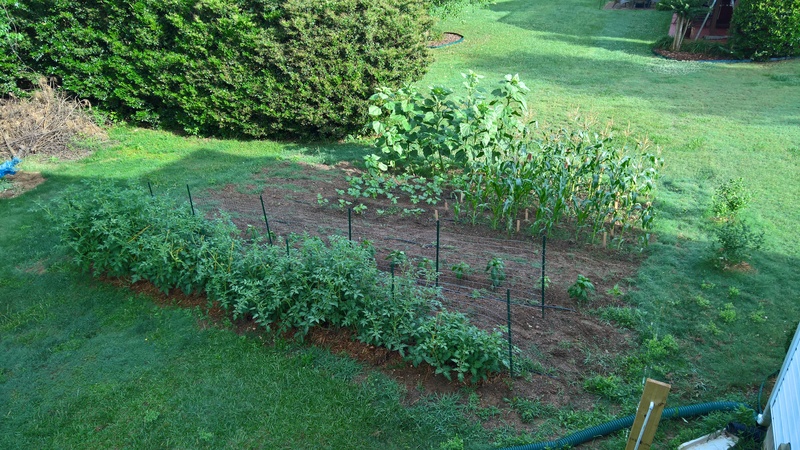 Top left in this shot are giant sunflowers. 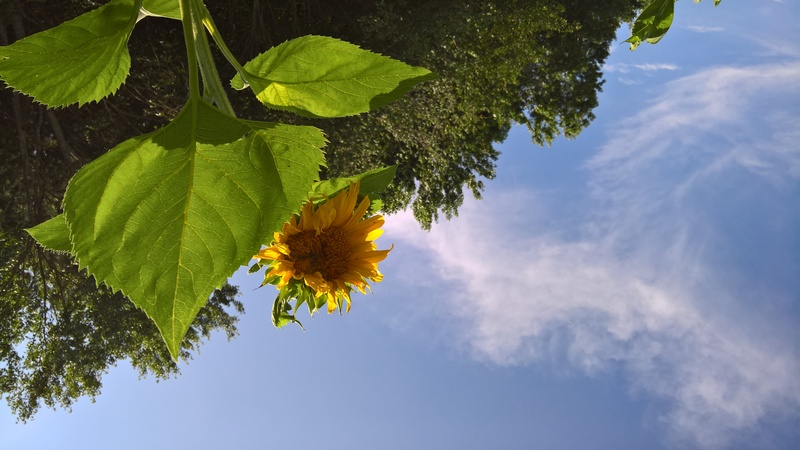 The tallest is almost 8′ with stalks that are around 3″ at the base. 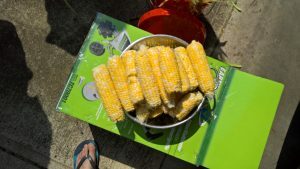 The sweet corn in the upper right only grew to about 5 1/2′. I think they tasseled out early due to stress of not having enough nitrogen earlier on. This is the first year I’ve done this, so I’m still learning. Just to the left of the corn and lower down than the sunflowers are okra plants. The top left bed is cucurbits which is overflowing. 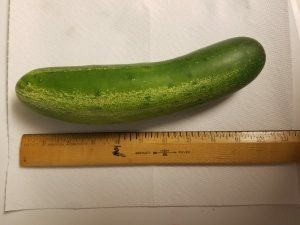 Something to keep in mind for next year is to plant fewer of them. 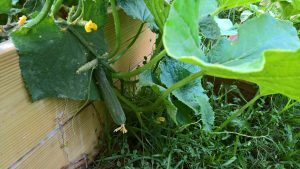 There are cucumbers, summer squash, butternut squash and cantaloupe in that grouping. 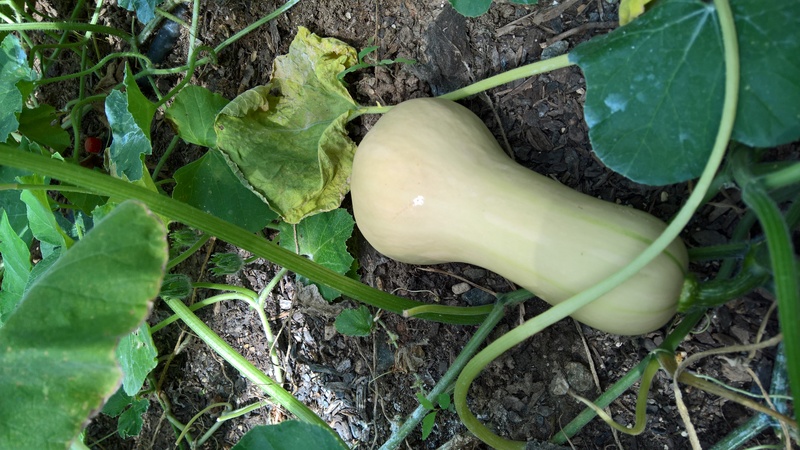 The butternut squash is a monster and is crawling out of all four corners of the bed. I’ll have to figure out if I dedicate an entire bed to that one next year. 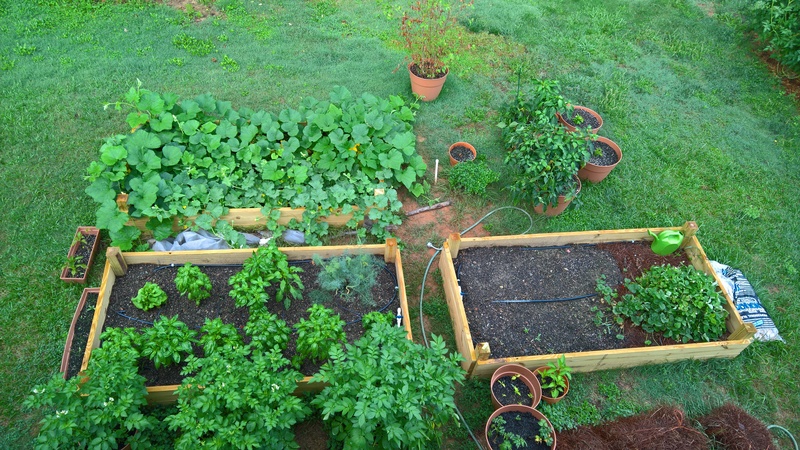 The bottom left is butter lettuce (only one survived), sweet basil and dill. 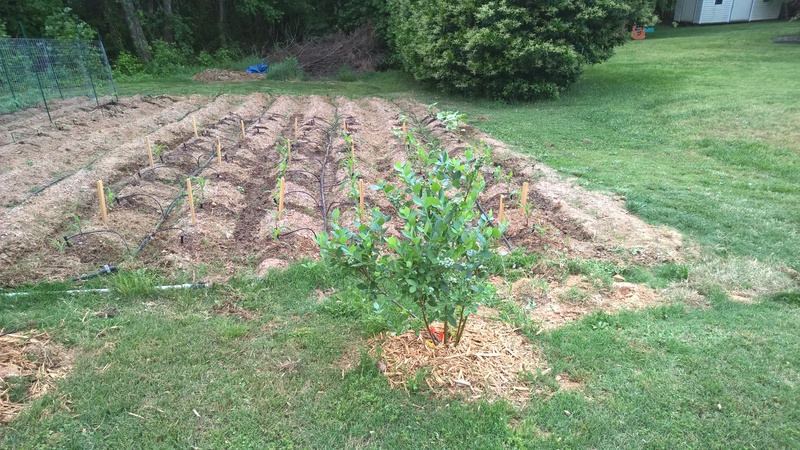 Just in front of those are several pots of potatoes, most of which are doing well. The bottom right is strawberries and garlic. The strawberries are second year that were growing in a pot until spring. The garlic hasn’t done so well, only three of the cloves have put out shoots. Upper right are a few pots that stayed indoors over winter. The biggest is my jalapeno bush which is putting out large numbers of peppers. 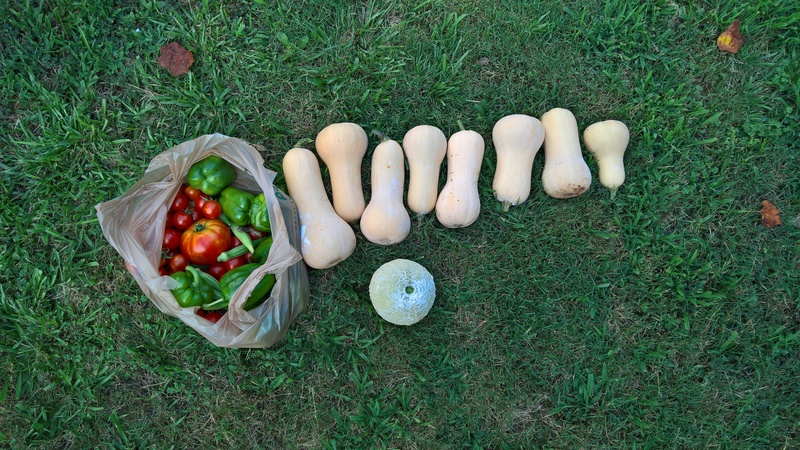 The slightly smaller bush is bell peppers. 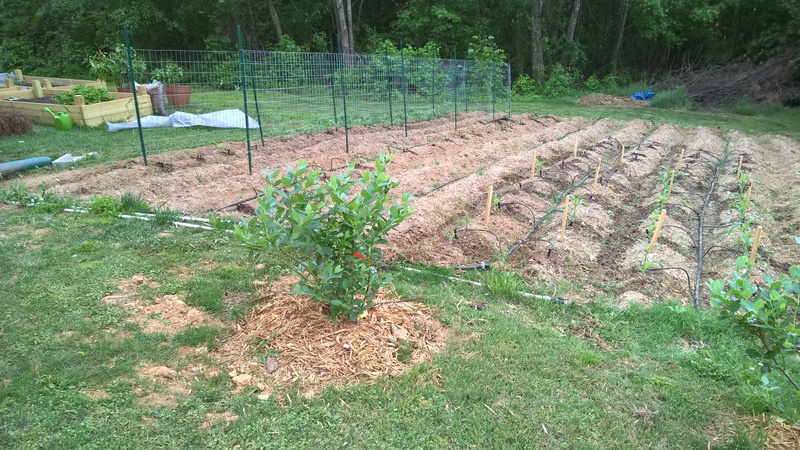 To the right are two lemon trees that I started last year. The little pot that all you can see is green is oregano.